Situated on a stretch of Jackson Street in the northernmost reaches of San Francisco’s Financial District, Kokkari is surrounded by some of San Francisco’s culinary heavy hitters like Quince and Cotogna, as if these restaurants needed to distance themselves from the overpriced franchises of international celebrity chefs closer to the heart of the district. The entire FiDi, in my opinion, is nothing much for looks. In general, I think of it as 1990 frozen in time – Wall Street hit the West Coast’s financial center a bit later – ok, maybe not frozen thanks to 25 years of wind, fog, and minimal upkeep. A bit harsh? Perhaps, but my point is all that neighborhood charm (or lack thereof) goes – stays? – out the window once one enters Kokkari Estiatorio. Inside Kokkari, unvarnished wood, rustic chandeliers, and woven textile tapestries transport the diner back to the Old World (Ok, a modern Old World). We instantly relaxed. We ordered a bottle of 2009 Rosati Cabernet Sauvignon from California’s Mendocino County, which had an unexpectedly high alcohol content for a cab (at 14.9%) and a great nose of ripe red fruit. It was a bit heavy for delicate Old World food, but Kokkari’s flavors could hold up to just about anything – not least the potent pine aromas of classic Greek retsina. Kolokithokeftethes, or Zucchini fritters = perfection. I’ve had some memorable incarnations of them in the past (Washington, DC’s Zatinya being one of them), but I think Kokkari’s won my heart. They were light, melt-in-your mouth texture, with a flavor tough to describe because each individual component was so well matched with the others that the sum is far better than each part. They were accompanied by thick, rich tzatziki. 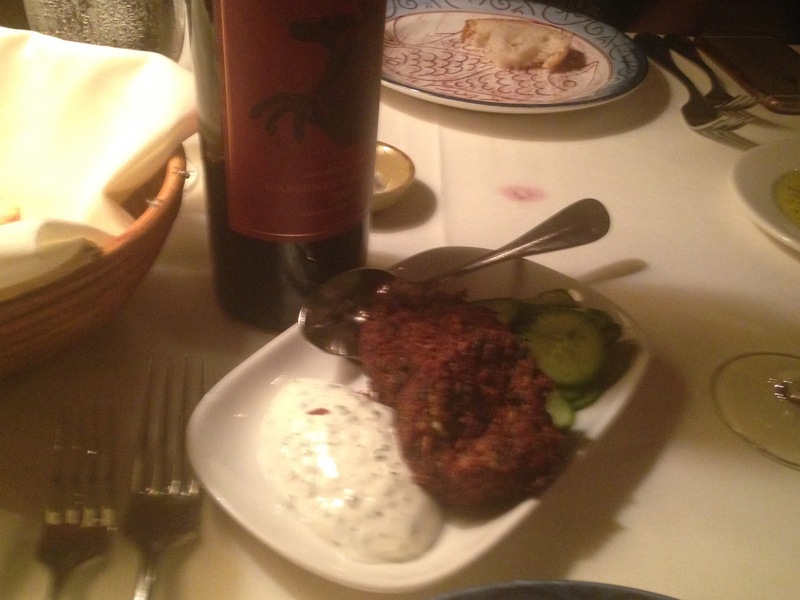 A word on Kokkari’s tzatziki: If you can imagine a farm-to-table condiment, this is it. The yogurt base is thick and rich; the cucumber subtle yet omnipresent; the dill fresh as if picked that day; the garlic enhancing and synthesizing the flavors – that ingredient you don’t really notice because it’s doing its job. It was so good, we had to order a side order of it. 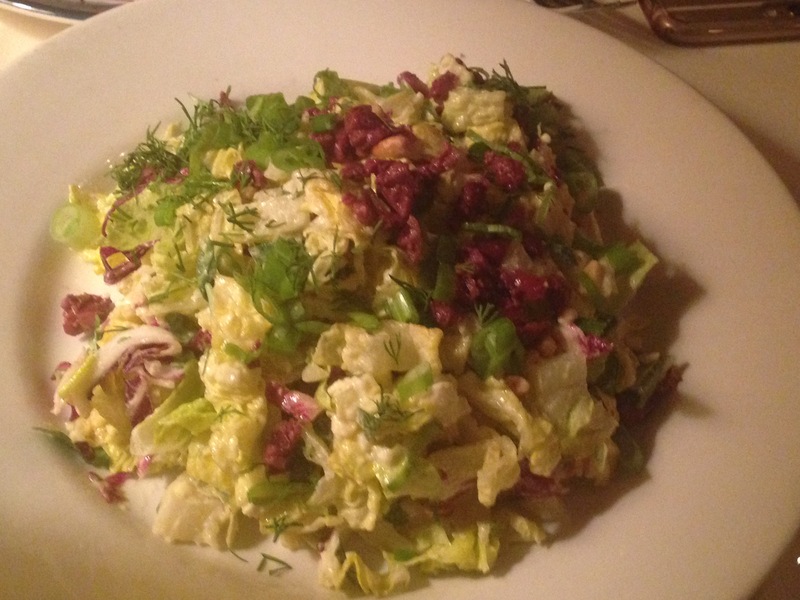 We ordered the Maroulosalata, generous portion of chopped salad with the salty, lemony tang of romaine and radicchio lettuces, kalamata olives, and pine nuts dressed in a feta vinaigrette. 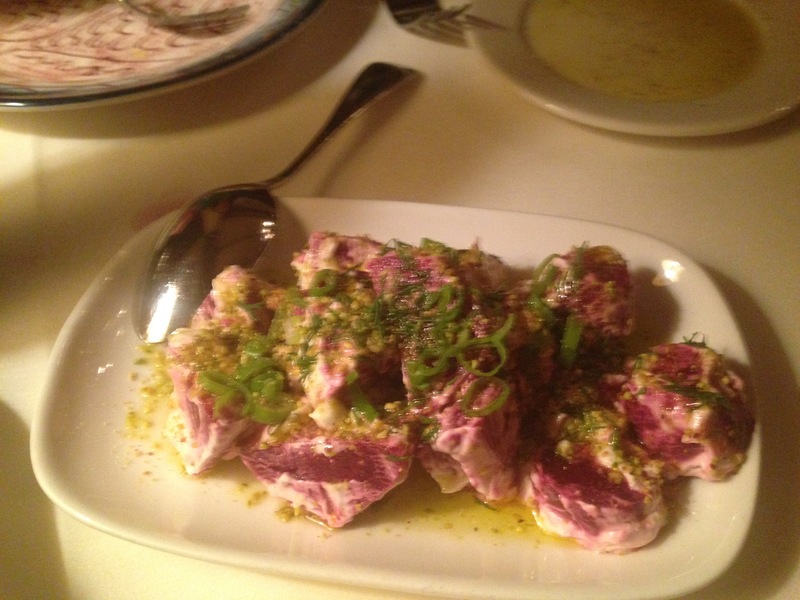 Our polished server brought us a complimentary beet mezthede (mezze) called pantzaria. despite our pants already being full (sorry, how could I resist a terrible turn at wordplay), we devoured. At that point, we should have stopped there. 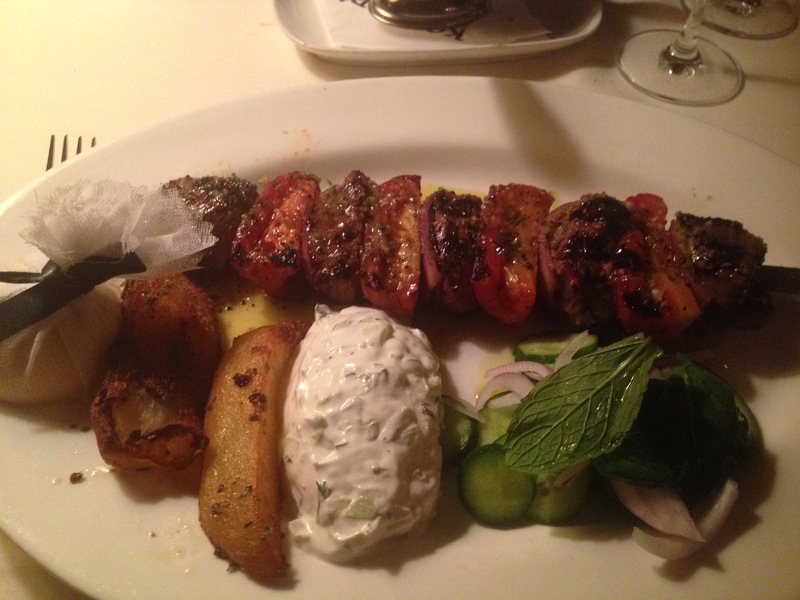 Every dish was fantastic, but I had little room for my main course – lamb souvlaki. The lamb was seasoned expertly, but it was perhaps not as tender as I would like. Had I been more hungry, and had I not tasted the perfection of the previous dishes, I likely would be raving about the lamb now. What I will rave about were the roasted fingerling potatoes. I rarely eat white potatoes (not a lot of nutritional value), but these were irresistible. Dipped in a bit of tzatziki, they are an addiction. I’m relieved they aren’t readily available. We had no choice but to request takeout boxes to save our lamb and tzatziki, and though we were painfully full, we had to see if Kokkari could elevate baklava the way it did every other staple of Greek cuisine. 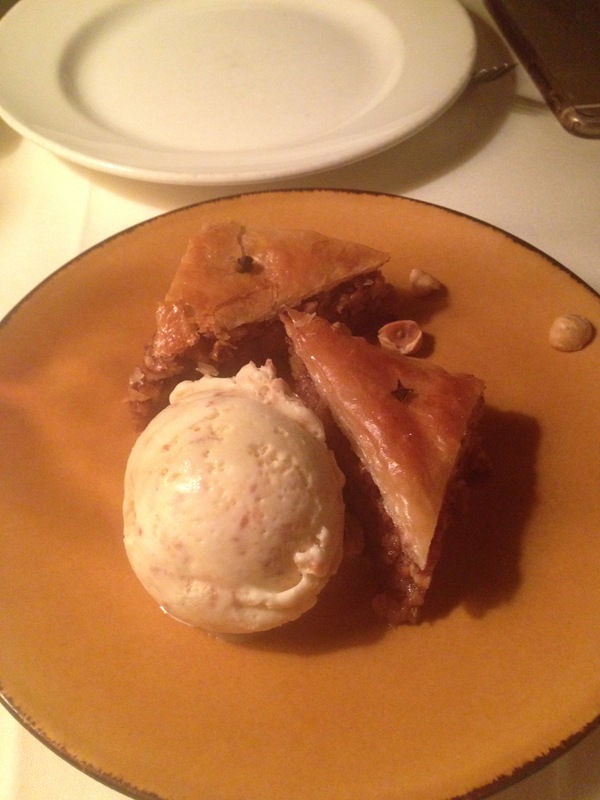 The verdict: the baklava was good but not memorable or distinct, but the accompanying vanilla-praline ice cream was one of San Francisco’s best (a tall order with greats like Humphry Slocombe and churned-to-order Smitten, or my own homemade creations!). It was impossibly creamy, smooth. 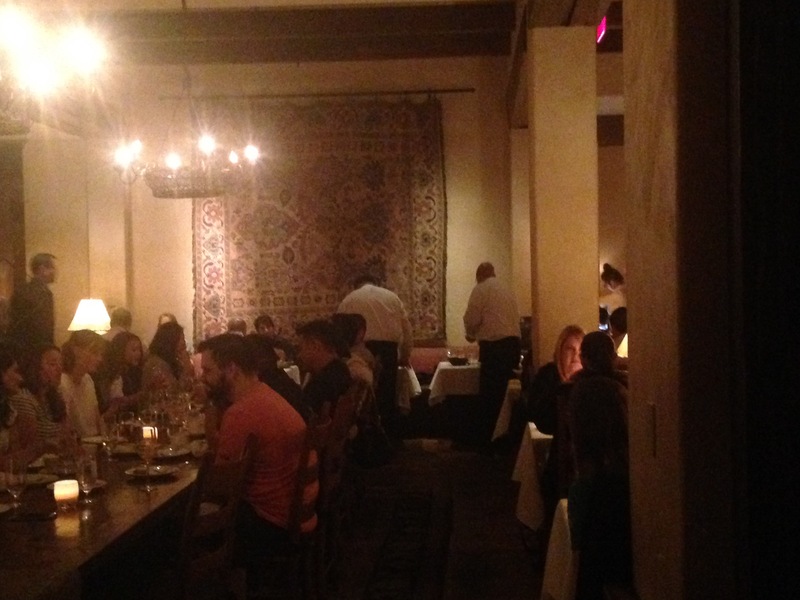 Kokkari offered everything one would want in experiential dining – ambiance, attentive service, and memorable food. To say I couldn’t envision it better myself is an understatement. I will return!